Thank you Markku. I changed there values and like magic the window is normal. I'm little crazy, i tried again to toggle to full screen and it's work fine now. Now, the good question is why when i toogle to full screen, i cannot back in normal mode ? xwininfo: Window id: 73400325 "KStars"
the item reduce from the menu is graying. The menu switch "full screen" or the keys shortcut doesn't work. I need your help. I activated the full screen mode on kstars, but from since i cannot out from it. I tried to activate/desactivate the full screen mode on the menu view but nothing does. Anyone know a trick to restore the kstars window to the normal size ? from the indi control panel, when i want to activate the debug option (from the button), this option is enable and disable immediately. I just a time to see on the bottom on screen the fields needed for debuging before that are hidden. Do you know what's happen ? 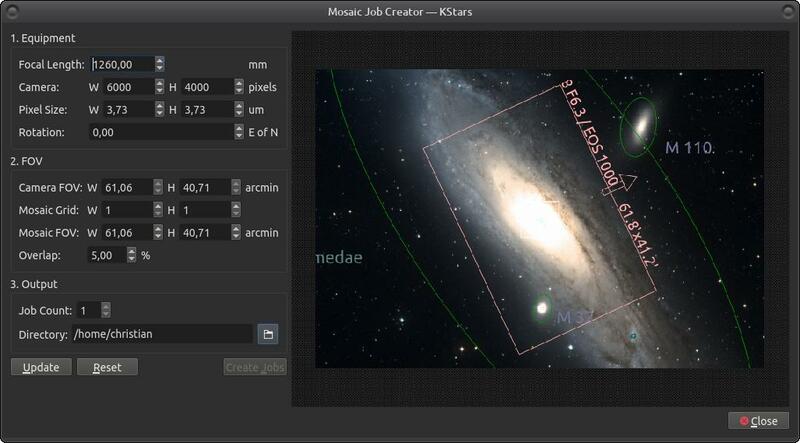 When i want to create a mosaic job, only focal length has been retrieved. The image size and sensor size doesn't. I must entering it manually. could you retrieve this informations from the sequence file or profil ? in the third picture, i see that you guide thru the asi camera and not thru your mount. Is it normal ? i wrote a topic about that.